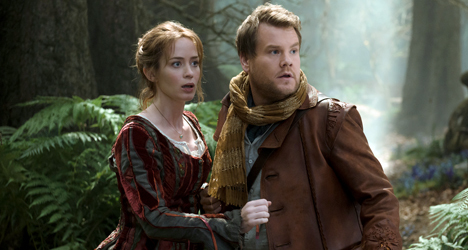 James Corden and Emily Blunt star as the unnamed baker and his unnamed wife in "Into the Woods." With this musical fantasy, director Rob Marshall (“Chicago”) probably has the goose that lays the golden egg when it comes to the box office this holiday season, but it’s hard to come up with a substantial reason to visit this mishmash of classic fairytale characters (Cinderella, Rapunzel, etc.). Adapted from James Lapine and Stephen Sondeim’s Tony Award-winning Broadway play of the same name, “Into the Woods” is a misfire on almost every level (this coming from someone who knows his fair share of kitschy show tunes). 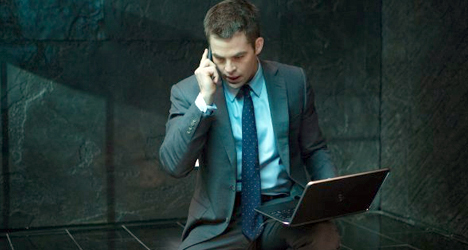 In the film, Marshall along with Lapine, who penned the screenplay based on his own book, focus the story on a nameless baker and his wife (James Corden and Emily Blunt). Unable to have children, the couple turns to a nameless witch (Meryl Streep) who promises them a child if they go on a mission for her (think the Wizard of Oz asking Dorothy to procure the Wicked Witch of the West’s broomstick, except not nearly as interesting). Their assignment: to bring to her a “cow as white as milk,” which belongs to Jack from the Jack and the Beanstalk tale; a “cape as red as blood,” which belongs to Little Red Riding Hood; “hair as yellow as corn,” which belongs to Rapunzel; and a “slipper as pure as gold,” which belongs to Cinderella. What comes out the other end is an awkward mess of a narrative with a tone that goes from playful family-friendly fare to a story about death and deception all wrapped up in collection of Broadway tunes that – with the exception of the title song – are far from memorable. Sure, some of the Grimm Brother’s stories get closer to their original text, but Disney seem to be trying to have their cake and eat it, too, by attempting to cater to the kiddos in some scenes and then flipping a switch. For example, cutting off the heels and toes of Cinderella’s wicked stepsisters when they try to fit into her shoe probably isn’t what most five year old children remember happening in the classic 1950 animated movie. Happy-go-lucky mice, yes. Self mutilation, not so much. When Johnny Depp comes out in full Johnny Depp mode (he’s wearing wolf whiskers and singing about “plump pink flesh” while salivating over Little Red Riding Hood), audiences will wonder who this film is actually for. Fans of the stage play might have an invested interest, but with the exception of a few technical achievements (art direction, costume design and make-up), this isn’t a musical with anything to say (much less sing).